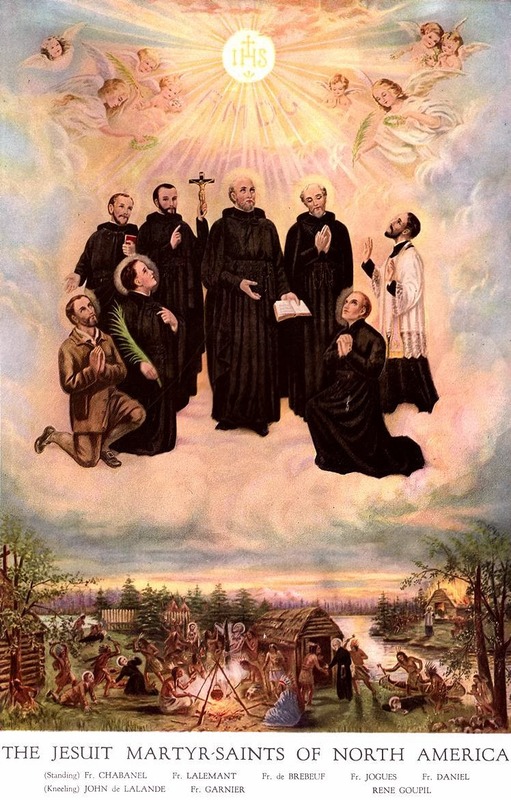 Eight Jesuits, Jean de Brébeuf, Noël Chabanel, Antoine Daniel, Charles Garnier,René Goupil, Isaac Jogues, Jean de Lalande and Gabriel Lalemant, sacrificed their earthly lives to spread the Good News of Jesus Christ in "New France" (Canada) in the Seventeenth Century. These Blackrobes were on mission with the Hurons, the Mohawks, and even the Iroquois (while under their capitivity). For those who have the illusion that the Pre-Columbian era Aboriginal Americans were "noble savages", it is worth watching Black Robe (1991) which depicted St. Gabriel Lalemant's journey in faith. Reading about the horrendous torture which these North American Martyrs suffered at the hands of unhappy campers in order to witness their faith is remarkable. However, I was impressed by a homily by Fr. Joe McCloskey, S.J. about one of the Jesuit Martyrs which was remarkable for his ordinariness yet faithful dedication. Noël Chabanel was a Jesuit who was highly esteemed in rhetoric and learning who was sent on mission to New France. Despite his reputation for learning, he could not master the Algonquin language. Moreover, when he was sent on mission to Fort Sainte-Marie (near Midland, Ontario) to minister to the Hurons, he found that he could not stand their smell, their food nor adjust to their way of life.
. When St. Isaac Jogues, the leader of the Jesuit missionaries, known to the Indians as the "Black Robes", was slain in 1647, Noel was offered the choice of returning to France. Yet Chabenel chose to keep his qualms to himself lest he be reassigned. So much so, Chabanel, made a vow to God in 1647 to remain with the Indians until his death, despite his personal aversions to them and their life style. Chabanel came to believe that his own "martyrdom" was a bloodless one in which he was asked daily to give his life in service with very little personal sense of reward or accomplishment. Two years later, Chabanel was murdered by an apostate Huron and the Black Robes body was tossed into the Nottawasaga River and was never recovered. No one but a masochist would want to die as the North American martyrs did, many may find that their lot in life is a bloodless martyrdom like St. Noel Chabanel.